Flexible Dock Structure. Sony make.believe Personal Audio System. 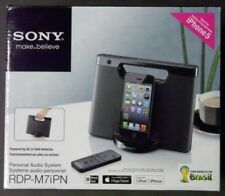 Sony Audio System Model: RDP-M7iPN. Shelf worn could knicks, dents, discoloration, scratches, marks, and etc. Deck for iPhone 5. Made for iPod touch, iPod nano, iPhone 5.